WW1 Reenactments Equipment : Great War Tommy WW1 Food Rations Labels : Cadburys Empire Chocolate wrapper, circa 1910. WW1 Reproductions and WW1 Reenactors Equipment / Kit - Cadburys Empire Chocolate wrapper, circa 1910. Cadbury's "Empire" Chocolate wrapper, circa 1910. 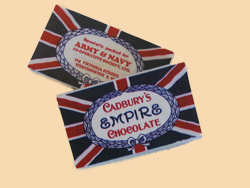 Colourful and patriotic Union Flag design chocolate wrapper ideal as a 'comforts' gift to those in the trenches.